What’s most terrifying is not the draconian decree, but the belief that any time a child is unsupervised the child is AUTOMATICALLY IN DANGER, which means that parent is AUTOMATICALLY NEGLIGENT. This is a new world view and it criminalizes not just parents who believe in their kids, but parents who believe in rational risk assessment. Our children today live in the safest times in human history. To treat them as if they are endangered merely by going outside on their own ignores reality. It also ignores the fact that the number one way kids die is as car passengers, as many parents who are forbidden to let their kids walk will inevitably end up driving (and thereby endangering) them. Finally, is it really the job of the police to provide THE safest environment possible? So should they make kids scoot down the stairs on their bottoms till age 12? Should they force kids to wear helmets in class, in case of falling ceiling chunks? Should they require the lunch ladies to put the fish fillet sandwiches in the the blender before serving, to minimize the chance of a child choking? When does “safest possible” become TOO safe? Here in Belgium last week a 5 year old kid on his bike died when he crossed the street on a pedestrian crossing, and a truck grabbed him. Thankfully, the debate is NOT whether he should have been driving his bike to school at that young age, or whether his parents could have prevented this! The debate is about when we will learn that trucks do NOT belong in city centers or near schools at the same hours as kids drive and walk there (often alone before they are 12 years old, yes!). And that economic reasons are not good enough to endanger children’s lives. (But let’s not fool ourselves either: nothing is going to change. Not right now, anyway). Remember when people used to be able to distinguish between “can” and “may”? Miles is a tiny little town in the back of no where (population about 2000 people)… The type of town where everyone knows everyone by name. It is a 2hr drive to the nearest city. There has to be more to a story about an unsupervised kid getting nabbed. Some googling turn this up.. Apparently even the Qld police commissioner said there was “more to this story”. My guess is that the police had reason to become involved and where looking for useful law. and this much more reasonable commentary from the Miles police sergeant.. Surely the law here just says, don’t leave your children for an unreasonable time without making reasonable provision for their supervision and care. How long is “unreasonable” and what “reasonable provision” might look like will differ according to the age and competence of the child. I would not expect a court to convict a parent for allowing their 11 year old child walk a mile to their local school. They might take a different line with a 5 year old, depending on the circumstances. It might be OK for a 5 year old to walk with their older sibling, for example. Oh, just noticed the news reports on this are from August 2016. Here is another. Okay, then, so why are the parents necessary to this process? Are the police not capable of performing this self-stated task themselves? Rather telling. I wouldn’t feel safe in a place where parents could be jailed for letting their kids walk down the street. I hope there is a big uproar over this. It would seem to me that the children ARE being supervised — by the police. So what they’re saying it’s not safe around there to let any child under the age of 12 walk or bike to school, even with a police presence? 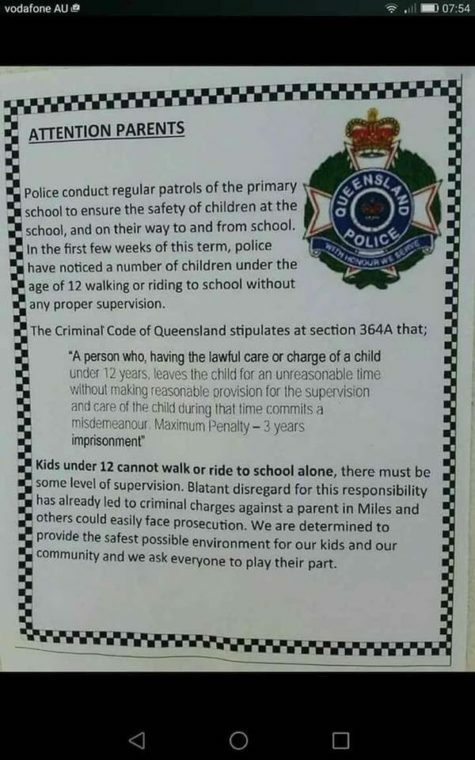 I’ll offer up a bit of defense for the Queensland police… you’re assuming that conditions in Australia are equivalent to conditions here in the U.S. that you are familiar with. This is not completely the case. Australia has dangerous wildlife, and there are probably parts of Queensland where the wildlife might present an actual danger.. The statute does NOT say that it’s illegal to let your child walk to (or from) school. It says that it’s illegal to leave the child alone for an unreasonable amount of time with no provision for supervision during that period. I’m not in that jurisdiction, and of course I’m fresh out of children under 12, or I might consider civil disobedience and become a test case. How do schools get to “dictate” what happens off of school property? If one of their students walked from home to a store next door to the school, would they have something to say about that as well? Shouldn’t how the kid arrives at school, which occurs off of school property, not be anyone’s business but the parents? I suppose this is one more drumbeat march in the direction of removing or replacing parental authority, with the government. Then again, schools are now run and structured more like prisons than places of learning, so I guess it all makes sense. I think the focus should be on preventing these rules getting adopted in the first place. It’s easier to protect status quo than changing things when it comes to legislative initiatives. I love Israel so much! Last night, my 13yo daughter and her friends were out until 11pm without an adult. They went to the mall, went out to dinner, and they took the train each way. They all had their cell phones, and were never in danger for a minute. This is in the “Super Scary Middle East”, where the media would have you believe is a blood soaked war zone. The fact that this is in Australia really surprises me. I thought it was the United States that had the monopoly on the OVER protection of kids. I think we need to let go of the idea that “proper supervision” means “Parent physically there, watching Child,” when “proper supervision” for that child, could mean any number of things–it could mean, Parent walks Child to and from school, it could mean, Child walks to and from school, but with a cell phone, and calls/texts Parent upon arrival at school, and arrival at home after school, or it could even mean, Child walks to school completely independently, after being taught how to do so safely. The child could also walk with neighbour kids, and/or older siblings, if there are any. This is an easy concept to grasp with adults–most places of employment have supervisors, so a typical day there might consist of the supervisor saying, “Good morning, Sam and Sarah. Today, I’ll be interviewing some new staff. Sam, I’d like you to get started on the TPS reports, and Sarah, I’d like you to update our brochure, since we’ve had the same one for a few years now.” Then Sam, Sarah, and Supervisor would go off and do their respective jobs for the day. Presumably, when Sam and Sarah were hired, Supervisor would have had to describe how things were done at Hypothetical Situations Incorporated, but at this point, they’re familiar with the procedures, and can be trusted to handle things independently, so it wouldn’t be necessary or appropriate to hover over them–so, in this case, “proper supervision” means leaving them to their own devices, unless they have questions or need help with something. Likewise, an eleven-year-old (or even a ten, nine, or eight-year-old) would have traversed the route to and from school (or the bus stop) many, many times, and would probably be able to make the trip without an adult right there. Anyway, I lived in Australia myself for most of 2010 and 2011 (albeit in a different part of Australia–I lived in Wollongong), and there were no such rules–kids walked, biked, skateboarded, and took public transit all around town. School-aged kids’ bicycles often had racks on the back for surfboards, so they could bicycle to the beach and go surfing, without an adult. When I volunteered with the Girl Guides, parents didn’t stay–even the blind girl in the Brownie unit attended meetings independently, without any problems. There was nothing “unsafe” about this at all–in fact, I’d argue that teaching kids to keep themselves safe, is actually safer than hovering, because adults aren’t perfect. On the flip side of worst-first thinking, for all those news stories about child abduction, et cetera, there have also been stories about kids doing the Heimlich manoeuvre on someone who was choking, or calling 911 for a parent or adult caregiver who’s passed out in a diabetic coma or gone into labour (or whatever), or pulling their adult out of a swimming pool when they’re drowning, or alerted the whole family when they smelled smoke, and got everyone evacuated safely, or even gone back INTO a burning house to rescue the baby/dog/whatever. A child who’s been helicoptered from birth to the arbitrary minimum age (which keeps rising), isn’t going to be able to do that. Even if they learned the Heimlich manoeuvre at school or Scouts, or how to rescue a drowning victim at swimming lessons, or whatever, living their whole lives with adults right on top of them, doesn’t foster a sense of competence, so when it comes down to it, they aren’t going to feel confident in their ability to take charge of the situation, and actually use those skills. I lived and worked in Israel from 1992 thru 1995 and I was very impressed on how free range the Israelis were with their kids. I even saw kids as young as 12- and 13-years-old out hitch hiking all over the country! Groups of kids would also come up to my door on scavenger hunts with no adult present. I haven’t been back there since so I was worried they might have acquired America’s paranoia over the safety of their kids. Sounds like it hasn’t sunk in over there as of yet, Thank God! We’ve had stories on this board from Australia before. And Canada. And Britain. Maybe it’s an Anglosphere thing. So, given that rule in my town, I may have to attach a long string to my child which I can attach to my self in my house, for the duration of her walk. Once she reasonably should be at school, I can wind it up. Technically, she’s with me. That should keep me out of jail, hunh? Possibly block off a road and driveway or 2, but maybe demo how stupid the rule is. Hey, I could even put a tin can on each end. Then, she could talk to me–you know in case she forgot the way or something. I imagine if there were dangerous wildlife, children would be taught how to deal with it and avoid it (as we are with bears) and/or a town with a real problem probably wouldn’t want their kids own their own. Can’t make a law based on one town that covers several areas. When I was under 12 living in Sydney Australia(30 years ago) there were no particular rules about what age you could walk to school, just parental common sense. We weren’t allowed to ride bikes to school until year 3(approx. 9 years old) and I think I started when I was 9 1/2. Certainly by 10 I was riding to school, and to friends houses several KM away from home. I had encountered snakes on the way to school, but the only animals we ever received official warning about were magpies, especially in nesting season. They delighted in scaring off everyone from their territory, and biting ears and drawing blood was common. And, more the problem, you might run into traffic while trying to get away from these crazy magpies. Of course, then vs now, I’m not living in Australia now to know what my old school rules are for todays kids. The article says that there is “more to the story” but doesn’t say what the “more” is. The parent had done something deserving of prosecution, then they should have used the matching law. One should note also, that they do not even have a scare story about how an unescorted child was dragged off an eaten by Dingoes or such. The only thing they can do is to remind parents that *they* will be dragged off by a pack of wild police and harassed and even jailed. I keep thinking about my poor children who look years younger than there age until there at least 16+. My 13 year old is regularly given kiddie cups at restaurants. I’m imagining that they would be picked up and brought back regularly – I supposed I would have to produce a birth certificate. Do they need to keep their “papers” on them at all times? Time for 10 and 11 year old kids to have help fling lawsuits that their rights are being abrogated. The whole situation is so dystopian…. The whole case is founded on one word , “reasonable “. What is reasonable for one child or to one parent is not reasonable to others. The bigger issue is how people are letting the state make this determination for everyone. >>The whole case is founded on one word , “reasonable “. Yes, and of course, the state is going to set the line at what's "reasonable" for the least capable child……and that's going to become the new normal, until some freak accident happens to some child whose parents are following that rule, at which point the state is going to up the ante. So, an adult-supervised walk to school, will (d)evolve into forcing the parents to hold their children's hands, which will later become a mandate for the children to be chained to their parents, and so on, and so forth. In Switzerland, our friends are actively discouraged from walking their children, from age 5, to school. As in, the school puts out a note asking for parents please to say goodbye at home and allow their kids to get to school on their own. Kids in Switzerland have special little glow vests so they’re easily visible and the children are so independent, confident and mature. In Australia, we’re letting our 7 y/o get himself to and from school. The only fear is the one road he has to cross that does not have a pedestrian crossing. He’s very conscious of looking properly, however, and the fear (ours) is outweighed by the tremendous sense of satisfaction and self-confidence this little 3 minute experience gives him. Maybe it’s the small town living, but when I was a kid (first, second and third grade) I walked from my house 3 miles to the video arcade and back. To think that would possibly get my parents in trouble if it happened now is almost too silly and too frightening to think about. My six year old kindergartner is very proudly walking by himself to school (about 2 blocks, with a neighborhood street and a busy road that has a stoplight and crossing guard). This took the whole school year up until last week to achieve – on the first day I took him all the way to his table in the cafeteria, then to the door, then to outside the door… etc etc until he finally said goodbye at home and went alone. If I had to tell him now that he had to wait his ENTIRE LIFETIME OVER AGAIN before he could go alone, there would be (totally justified) rage and confusion. A Queensland Police media spokesman told Daily Mail Australia that the parent charged in Miles had let their children ‘wander around town unsupervised’ while acting in a ‘feral’ manner. He said that a 33-year-old woman had been charged after police allegedly found a 6-year-old girl walking alone trying to make her way to a location far away with the use of a hand-written map last year. So an issue about allegedly irresponsible parents of 6 years-old is transformed, as often in our days of overreach and blind application of the “principle of precaution” to a iron rule applicable to pre-teens and teenagers. Then if a 12+1day old kid has an issue, the age limit is gradually hiked until the magical 18. Assuming it is not exactly illegal to let kids walk alone and that the actual text does imply that it’s about reasonability and and the parent of an older child would not be prosecuted simply for letting their child walk alone, there are still problems with ordinances/laws like this. Vague statements leave a lot of room for interpretation and enforcement. What is reasonable? Who decides? So in the example of the parent of an 11 year old not being charged with anything if their child walks a mile to school, this may be true under normal circumstances when nothing out of the ordinary happens. BUT, what if something bad DOES happen? Laws like this make it easier to prosecute good parents. So if the 11 year old gets hit by a car and dies or gets kidnapped, now prosecutors can make a case against the parent citing this law. Because “reasonable” is vague and so IF something happens now it can be interpreted as an “unreasonable” action. We do risk assessment every day for our children. It would be a rare occurrence for something bad to happen to the child on the way to school and therefore we determine that the risk is not high enough to offset the benefits. The fact of the matter is, though, that sometimes rare occurrences happen. Why must we insist on placing blame on the parents? If somebody kidnaps or molests the child, the blame lies on them-not the parent (assuming it wasn’t the parent that did it of course). If somebody is driving recklessly/drunk and mows down your kid it is their fault, not the parents. Whenever something bad happens to a child I see so many “where was the mother?” comments. As if we somehow get psychic abilities, super strength, and other super powers the moment we give birth. Where are these mothers that can predict what’s going to happen all the time in order to prevent it or somehow can solve every problem just by virtue of being there? In reality, sometimes it’s not anybody’s fault. Last year, I was driving through my neighborhood when a toddler broke free from his mother (or somebody) and darted in front of my car. Luckily I was able to avoid him. Had I hit him, whose fault? Mine? I was going 15 miles per hour and paying attention to the road. The mothers? She was holding his hand and with her less than super strength he was able to break free. The toddlers? Well sort of, but you can hardly hold a three year old accountable. Blanket laws like the one above make it easier to assign legal blame. In my example the mother was there and since you can’t mandate keeping children indoors where bad things can happen or outdoors (cause something bad could happen indoors too!) they get one step closer to being able to assign blame by requiring a parent be present. So if the child in my was say 8 instead of 3 and playing out in the yard alone, while the parents probably wouldn’t be arrested if nothing happened. If she did run in front of me and I did run her over, well it would be all to easy to throw the mother in jail for leaving her child without “reasonable” supervision, rather than just calling it an unfortunate accident. I thought I’d better add my two cents worth here. I live in the outer north suburbs of Brisbane, QLD. I can vouch for a fact that children under 12 freely* bike/walk to and from school without being picked up by the cops. It was only just this week that I passed a boy riding his bike ALONE after school, presumably on his way home. He couldn’t have been any older than 7. *this of course would vary from parent to parent. Is this your first visit to this site? The overprotection of children is everywhere and Lenore has done an excellent job of finding stories from all over the place. How is that anything but just backpedaling? You can’t say that kids under 12 cannot walk alone, and parents who “blatantly disregard” the responsibility to supervise their children “could easily face prosecution,” and then act like parents are expected to use common sense, and that we should just know that you didn’t mean 11 year olds can’t walk to school. Nonsense. * I let my then 6yo go to the bathroom alone, and another mom was so surprised — because she thought he was 3. * When I first let my then 5yo daughter go to the park with her big brother, she kept getting stopped by people who thought she was a toddler. * When my middle two boys were little, someone thought they were twins — even though the older one was big for his age, and twice the size of his brother, who was small for HIS age. * My oldest daughter is 19, and she and I are frequently the targets of people’s confusion about age. Someone thinks we’re the same age, and both in high school. Someone else thinks she’s 12. Or they think she’s the mother of one of her younger siblings. (The worst example was when she was 17, and someone thought she was the mother of her 16yo brother!) And when my youngest was a baby, multiple people thought my oldest was her mother, and I was the GRANDMOTHER!! I can relate to that and it definitely makes me say ugh sometimes. When I was 14 my mom and I went to the mall but went our separate ways. Security stopped me and refused to believe I was older than 8 years old (and honestly I think mature 8 year olds could probably handle shopping alone for a bit but that’s a different story) and held me until my mom came to retrieve me. 14 year old me was so embarrassed! Then just last week the grandmother thing happened to me. I’m 33. The kids frequent this corner store when they have a few dollars for goodies. My sister (who is 23) usually takes them as she provides live in nanny for me, but last week I had some time off and walked them up there. The clerk recognized the kids and asked if the little one (age 3) was my granddaughter! Yes, I know it’s biologically possible for me to have a 3 year old granddaughter, but it did make me question whether I looked “old” or not. But, pretty sure I look my age and people are just bad at guessing the ages of people that aren’t in their age group. AmyP, I’m only 35, too. (I adopted my oldest two, so I’m actually barely old enough to be my oldest daughter’s mother.) I guess technically, it’s biologically possible that I’m the 19yo’s mother and she’s the baby’s mother. But it’s crazy to me that one person thinks that, and then the next person is scrutinizing my ID because she doesn’t think I’m old enough to buy cigarettes. I don’t agree with the state telling parents how to raise their children. But in a world of worse case thinking first, paranoia, and ignorance, this at least is written out. With no confusion of age, and penalty. And it’s law. In America, it’s just implied, and open to interpretation. And at the discretion of the police or CPS. And each State is different. Very confusing for parents. I thought the Australians were brave and civilized–not wimpy and paranoid like our team. Indeed, the fearful seem to be attracting huge followings. (sorry, not sure what code to use to link on this site!). Ah, lookie at that! It does it automatically! Must be a miracle that I survived long enough (I’m 49 now) to write these lines. At the age of four my parents made me walk to the Kindergarten and back, half a mile away. When starting school at six nearly all children would walk there, same distance as before, different direction, from the age of eight I rode there on my bike. Parents at that time would have been declared mad if they hovered around their kids. Now that was good ole times here in Germany. Did I mention, that this was at the height of the left terrorist attacks that occured in the seventies? >>A Queensland Police media spokesman told Daily Mail Australia that the parent charged in Miles had let their children ‘wander around town unsupervised’ while acting in a ‘feral’ manner. Walking somewhere with a hand-written map is "feral?" All right then…….I guess we should all be on the lookout for wild, ferocious animals carrying maps. Well, as it turns out, both the Australian legal system and the U.S. legal system are descended from the English system, so they are probably quite similar. Whenever a statute refers to “reasonable” something-or-other (and there’s a LOT of them that do), there are multiple correct answers. For example, using the statute at issue, if the prosecutor decides the person’s actions were reasonable, the case ends there, with no charges brought. If the judge decides the person’s actions were reasonable, the case ends, either by dismissal or by directed verdict. If the jury decides the person’s actions were reasonable, the case ends with acquittal. Only if the prosecutor, judge, AND jury find the actions UNreasonable does the case end with a guilty verdict. The “vagueness” you complain of is actually better than the alternative, wihich is a statute that specifically lists all the things you aren’t allowed to do, which needs constant updating because people keep finding new ways to endanger their child(ren) that hadn’t been thought of before. Hi, I live in CA. The police put me in jail for letting my son walk outside less than a mile away from home. He was 8 years old at the time. I live in CA. 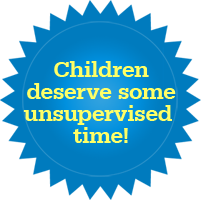 The courts tried me and ruled that “any unsupervised time” is equal to child endangerment. To date, I am refusing to pay the fine or perform any of the stupid punishments the court has imposed. No, Mr. Tang. The police arrested you for MAKING your son walk outside less than a mile away from home. Please stop pretending to be one of us. Please explain to everyone here then, how exactly does MAKING my son walk less than a mile from home INCREASE any danger for him, compared to LETTING him walk outside? Please include a list of dangers that actually increase when he is MADE to walk outside rather than I LET him walk outside. If you can’t think of any, then you do not belong on here. I follow the law, not some idiot’s daydreams or opinions of imagined dangers. Hint: You were neither charged with, nor convicted of, a statute that required any danger to your child be present. You were convicted under a statute that applies when the child is NOT in danger of great bodily harm or death. Don’t know of any. Do you? Hey… you’re not guilty of being out past curfew. Maybe you could work that into your defense, too. Uh, right. So what are they? Or are you conceding that you don’t “belong on here”? Your conviction by a jury of your peers says otherwise, sir. How’s the progress on your appeal? Do you know you will be required to cite actual law, when your appeal is heard? That they will cut you off immediately if you try to use the same tactics that didn’t work in the trial court, like claiming that the fact that you weren’t violating the curfew law means you weren’t violating this law, either? Will you be finding competent representation for that proceeding, or should we just assume you’ll soon be ranting about how corrupt those judges are, since they won’t entertain your cray-cray? When I was in sixth grade, I would walk to an elementary school, which was also the bus stop to my school. This was alright, but sometimes when I walked back, I would walk on the curbs. No big deal; I’d been running on curbs since I was five, and I barely ever held anyone’s hand for balance. If I fell, I just brushed off my jeans and started running again. Well, this time my stepmom (ugh) heard about me doing it when another concerned parent came in and told her about it. Apparently I was being too reckless; I could have fallen into the road. So… yeah. I was punished for having fun. This is very sad. I’m not even a fan of curfew laws, and this goes far beyond that. Note to Self: Don’t move to Queensland. Not that I was planning a trip to Australia anyway. So it’s a crime to put him somewhere where he is not in great danger? AKA it’s a crime to keep my child in a relatively safe public place? Why are you on this site again? since you seem to have a ton of time to respond to and critique my comments, I’ll lay out the specifics for you. I dropped my son off at a shopping center across from Serfas Club Park, area code 92882. (a park that he has walked to/from over a dozen times). My home is on Hidden Hills Way, 92882. Now please use Google map, satellite view, street view, etc etc and tell me that you don’t believe a perfectly healthy 8 year old cannot walk that distance by himself. As I suggested before, hire a lawyer to explain it for you. A) someone should be paid to put up with you, and B) maybe if you’re paying, you’ll pay attention. To torment you, personally and in particular. Now, if only you’d read the critiques. But you don’t, because I keep telling you the truth, which is NOT what you want to hear. You go first… tell me why I should give a damn? Let me try to put it into a framework you can understand. According to the original article, you’re a professional chemist. Imagine you sent a research assistant to wherever the chemicals are stored and asked for a small amount of hydrochloric acid. However, when the research chemist comes back, they tell you that they don’t have any hydrochloric acid because you’re out of nitrous oxide. So you tell them that nitrous oxide has nothing to do with hydrochloric acid, and send them back to get hydrochloric acid. Again they come back. Couldn’t bring back any HCl because there’s no methane in the tank. So you explain, still patiently, that you didn’t ask for methane, you asked for HCl. You send them back again, and again they return with no HCl, this time because there’s no Uranium Sulfide. How many times will you keep interacting with this person, before you decide they’re unable or unwilling to listen to you? You’re reached that point. There’s no point explaining it to you, you are unable or unwilling to understand no matter how many times the law is explained to you; and there’s a place for people who are unable or unwilling to understand how to conform their behavior to the law. It is clearly where you belong, sir. I don’t need you to explain anything to me. The law says clearly when kids can be out on their own, 10 PM. Therefore it’s not dangerous for them to be out on their own. The fact that I made him walk back does not increase the level of danger as if he were walking out alone before 10 PM. End of story. I don’t care what your definition of the law is. That’s now how I interpret it when I read it. If you don’t like my interpretation, you can choose to ignore me, but clearly you are nosy and incapable of minding your own business. Based on your interpretation of the law, anything free-range would be considered illegal under that law, in your own words. Hell, even staying at home would be considered dangerous. After all “not life threatening” means everything else under the sun. By your fantasized “butterfly-effect” interpretation of law, I should be arrested for “DUI” for drinking water, because I bent my head up as I swallowed some water and technically, water does influence my body, it hydrates my cells. So if you aren’t a lawyer, stop pretending you are, and stop pretending you support free range activities. And if you are a lawyer, then I pity you, that you would go to such desperate lengths to dissuade a parent who only wants to protect his right to discipline his child in a non-dangerous, non-life-threatening way, in your own words. You might make a great prosecutor. Unfortunately the world still has some of us “common sense” people who knows when someone is desperately fiddling with wordplay and nuanced interpretations to get a leg up for a few slimy dollars. You don’t like martyrs like me? Don’t live in this country then. This country was founded on martyrs. I’d say in recent times, we’ve had a shortage of people who stood up to police bullying. I will not back down ever. The deranged rant that follows shows how desperately you need SOMEONE to explain to you. Or better medications… I’m starting to lean towards that second one now. I’ve never pretended to be a lawyer. Cruelty to children is not a “free-range activity”, and I remain opposed to it. Good call putting “common sense” into scare quotes. You clearly lack any. Martyrs take their punishment, they don’t run from it. So, no, I’m not particularly impressed by “martyrs” like you. The word you were looking for there is “coward”. Cowards are the ones who run away from punishment. Seek professional help, both legal and psychological. For your own benefit, and for your family’s. I’m not running from punishment. What I did doesn’t deserve punishment and I appealed my case, so I’m not running from it. What have you done to support your free range ideals other than twiddling your thumbs on your keyboard and getting a hard-on at other people’s difficulties. You say I was cruel to my kid? Really? Walking less than a mile home before curfew hours. You’re the one who needs medication. Doesn’t matter if you disagree with my reasons, I don’t have to do follow your reasoning. I could have made him walk for whatever reason–to/from school, to play with his friends, to ride his bike, to get more exercise, any reason, as long as he’s not in danger. I’m the parent, not you. I know my community, not you. I know my kid can capably get home w/o any struggle, not you. For you to sit here and attack my parenting choice is the same rationale that helicopter parents use to attack the free range movement. Only difference is you’re attacking my choice of using free-range to discipline, rather than free-range as a way for children to explore their neighborhoods. Therefore, you do not belong here, helicopter parent. And you constantly feel the need to disagree w/ me as if my actions directly affect you. I didn’t write my article for you. Lenore didn’t write about me to invalidate what you feel are correct parenting choices. This is to educate the masses about police overreach. Not to make James Pollock feel warm and fuzzy and validated. Had I said “good job on not doing your homework, here’s $20, go to the grocery store and buy yourself some candy,” I’m sure you’d be singing a different tune. If my son had been 15 and not 8, you’d be singing a different tune. Even if you feel I did a piss-poor choice of parenting, it was not dangerous and that’s what differentiates me (along w/ the rest of the free range community) from fakers like you who think free range can only happen to/from school and under limited circumstances. Free-range is a lifestyle and belief that kids should learn by going outside and exploring. It’s not something you believe in and then don’t follow through because you’re too scared of the boogey monster or neighborhood busybodies calling the cops. That’s the definition of a hypocrite. So helicopter back on your fancy pedestal and go deliver your legal-speak for another website. It seems like you’re the only one here to disagree with me, so that alone should give you a clue. Its for me to decide what age my son can do this, and not you. Funny you should ask. I raised my child using free-range principals before you’d ever heard of them. I’m active in a couple of volunteer organizations for kids. Somehow, I managed to do these things without ever being arrested for abusing children. No, sir. I don’t know you. Your conviction for abusing your son says that.. I ignored the rest of your ranting, as I assume it’s equally devoid of relation to reality. Seek help. Both legal and otherwise. Argh. Stupid typoes. I do, in fact, know the difference between “principals” and “principles”.